According to tradition, the city of Rome was founded on April 21, 753 BC, by twin brothers, Romulus and Remus, whose father was Mars, the god of war. But the two argued about which hill to build on; and, when Romulus began building his city wall, Remus ridiculed his work by jumping over the wall. Romulus responded by killing him - thus determining which one Rome would be named after! In time, Rome would become the greatest city in the world, the capital of the greatest empire the world had ever yet known. To that same city, some 8 centuries later, came two men, Peter and Paul, brothers not by blood, but by their common faith in Jesus Christ, who had called them to be apostles. The Christian community they found in Rome was small, socially and politically insignificant - an easy target when the Emperor needed scapegoats to blame for a destructive fire. Among those martyred in that 1st Roman persecution of the Church were the apostles Peter and Paul. 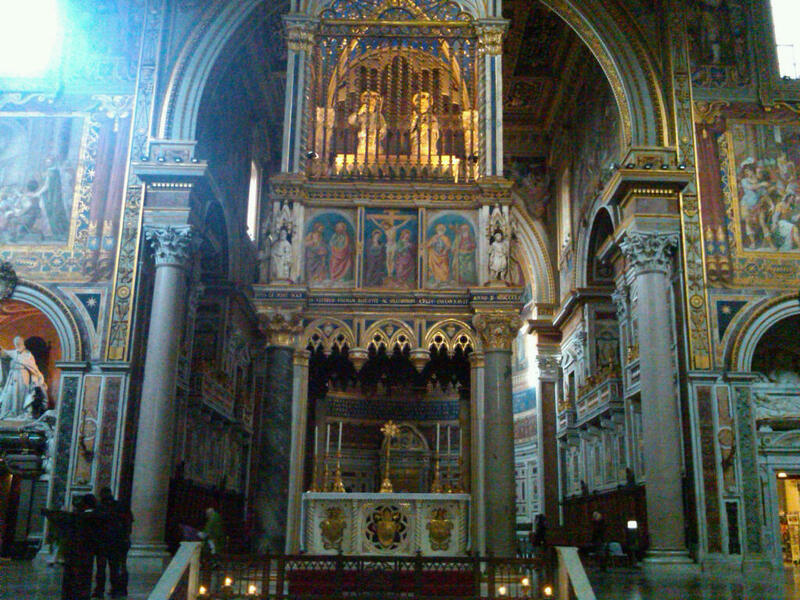 If the Christians of Rome required encouragement and confidence to persevere in their new faith, what more powerful reinforcement could they have had than the witness offered by the martyrdom of those two illustrious apostles, who were the Church’s link back to the Risen Lord himself - Peter, crucified on the Vatican Hill, and Paul, beheaded on the Ostian Way. Which brings us back to where we started. The old Rome of Romulus – proud, powerful, pagan Rome, based on the murder of one brother by another – was, for all its accomplishments and authentic grandeur, a human state like any other, a warring conqueror, conquered in turn by other warring conquerors. The new Christian Rome of Peter and Paul conquered that old Rome, but in a new way. Proud, powerful, pagan Rome, founded on the murder of one brother by another, was in turn conquered by the faith that empowered Peter and Paul as brothers-in-Christ to evangelize an empire and die together as witnesses to a new way of life. As we celebrate this great feast recalling the mission and martyrdom of Rome's great Apostles Peter and Paul, let us likewise – as Saint Augustine once recommended on this feast – “embrace what they believed, their life, their labors, their sufferings, their preaching, and their confession of faith” [Sermon 295, 8]. Homily for the Solemnity of Saints Peter and Paul, Immaculate Conception Church, Knoxville, TN, June 29, 2016. One of the most perplexing aspects of elite reactions to the UK's Brexit vote has been the widespread surprise that has repeatedly been expressed Over and over again, commentators have referred to the result as "surprising" or "stunning." Whom have these folks been talking with and listening to all this time? People who hang out in Davos? The same could be said, for example, of the "populist" revolts against some of the fallout from globalization that have overtaken both US political parties this election cycle - to the surprise (and chagrin) of elite opinion in both parties. It's OK to talk with and listen to people who hang out in Davis, but even more important to listen to others besides - especially to those being left behind by all this wonderful progress. One of the most distressing features of our contemporary culture is how the different social classes have so successfully segregated themselves, so that cultural elites largely listen only to others with similarly elite-sanctioned opinions. How else to explain the sudden "surprise" when the occasional exercise in real democracy allows other voices to be heard? That the economic, social, and cultural changes of recent decades have produced real and tangible benefits cannot be denied. but neither can it be denied that the principal beneficiaries of this whirlwind of change have largely been the well-off and the well-positioned - and that those less well-off and less well-positioned have found themselves largely left behind with diminished economic, social and cultural prospects. For all the elite emphasis on inclusiveness, it is precisely the non-inclusive character of so much of modern progress that has brought us to this current crisis. How different our society would be if many of those who lecture everyone else so tediously about inclusiveness would actually practice more of it themselves! Historian Steve Fraser, author of The Limousine Liberal: How an Incendiary Image United the Right and Fractured America (Basic Books, 2016) has captured the consequences of this process of political fracture. "Class," Fraser notes, "which had largely been banished from acceptable public discourse with the onset of the Cold War, returned with a vengeance but was camouflaged." What Fraser calls our "civil war of values" he portrays in all its class-based starkness. Resisting "secular elitists" and their allies, Fraser sees "an everyman army, people of faith, not only the pious, but all those workaday white folks who remained faithful to the way things once were or were imagined to be or were ordained to be." The point is not that things can - or ought to - be made to revert to "the way things once were." That is neither possible nor in many cases even all that desirable. The point rather is that the modern ripping apart of society has come at an enormous cost, which has burdened the many left behind, while enriching and empowering the few - and that now the bill is coming due. The rise of "populist" demagoguery - whether Huey Long and Father Coughlin in the 1930s or Donald Trump and Bernie Sanders today - is one unsurprising result. Yet we continue to be surprised and so fail to respond in a way which respects the casualties of the social breakdown produced by the predatory global capitalism that has so transformed our world. Either we have to relearn the art of community and how to be one society again, or we continue down this increasingly fractious road. Decades ago, as a boy growing up enveloped in the exuberant embrace of Bronx Catholicism, I remember being perplexed by the expression Saturday Office of the BVM, which appeared with some frequency on our home wall calendar provided by our parish church (courtesy, of course, of some local funeral home). It is, I suppose, a universal human trait to try to make things make sense. So for a while I imagined that the Blessed Virgin Mary had an office in heaven to which she faithfully went on Saturdays and where she regularly responded to people's prayers. Bizarre as it may sound to today's adult ears, that "explanation" seemed satisfactory - at least until I learned at school about the Divine Office and hence the real meaning of the term Saturday Office of the BVM. One of the liturgical joys of "Ordinary Time" is the opportunity it offers on many Saturdays to recite the Saturday Office of the BVM - or, as it is now named in the new liturgy, the "Memorial of the Blessed Virgin Mary on Saturday" - and, along with that, to celebrate one of the 40+ Votive Masses in Our Lady's honor which the current liturgy makes available for Saturday use. This practice of celebrating a Votive Mass of the BVM on Saturday is said to go back to Alcuin (735-804), Charlemagne's principal court Benedictine and primary architect of the Carolingian liturgical reforms. Alcuin composed Votive Masses for each day of the week, and honored Mary with two for Saturday. Subsequently, popular piety seems to have come to associate Saturday with the idea that on that first Holy Saturday Mary persevered in faith in her Son and in his promise to rise again. 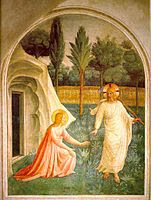 So Saturday's devotion to Mary is seen as “a remembrance of the maternal example and discipleship of the 'Blessed Virgin Mary who, strengthened by faith and hope, on that great Saturday on which Our Lord lay in the tomb, was the only one of the disciples to hold vigil in expectation of the Lord’s resurrection'." It is also seen as "a prelude and introduction to the celebration of Sunday, the weekly memorial of the Resurrection of Christ; it is a sign that the Virgin Mary is continuously present and operative in the life of the Church.” (Directory on Popular Piety and the Liturgy, 188; cf. Blessed Paul VI, Marialis cultus, 41). This being the Holy Year of Mercy, at Mass this morning I said the Votive Mass of Mary, Queen and Mother of Mercy. The Marian title Mother of Mercy has been ascribed to Saint Odo of Cluny (c.878 - 942). 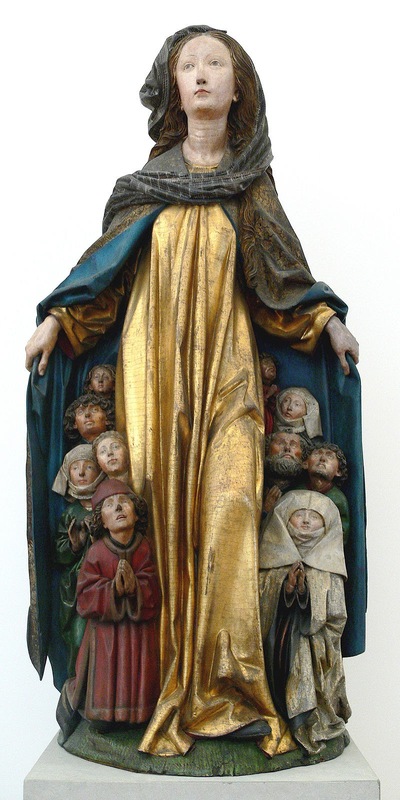 The votive Preface calls Mary "the gracious queen who has herself uniquely known your loving kindness" - an echo, I presume, of her Magnificat, a theme also picked up by Pope Saint John Paul II who referred to Mary as having "obtained mercy in a particular and exceptional way" (Dives in misericordia, 9). A suitable subject for a quiet summer Saturday! Somewhat to the surprise of their political elites (a surprise that itself speaks volumes about those elites' detachment from their citizens), the citizens of the United Kingdom voted yesterday - in the tradition of parliamentary democracy and its principle of responsible accountable government - in a courageous act of citizenship that has reaffirmed their national sovereignty and rejected the EU's Napoleonic aspirations. In the process, it may help trigger the long-term recovery of the values of democratic citizenship and accountable government among the European nations themselves. Such values are not anachronistic luxuries but rather are among the very few resources citizens have to resist the overwhelming power of global capitalism and its bureaucratic managerial elite. The EU had its remote beginnings in an admirable effort, in the wake of the disaster of the Second World War, to reestablish a framework for European political life and economic cooperation largely in harmony with the philosophies of the post-war Christian Democratic parties. The 1951 Treaty of Paris formed the European Coal and Steel Community among France, West Germany, Italy, Belgium, the Netherlands, and Luxembourg. This developed, through the 1957 Treaty of Rome, into the European Economic Community. Over the last 30 years or so, however, the European Community has evolved into something somewhat different and has long since left its Christian Democratic philosophical origins behind. In the process it has produced a growing gulf between its bureaucratic elite and the ordinary citizens of its constituent states. It is those increasingly disgruntled citizens whose voice is now being heard. 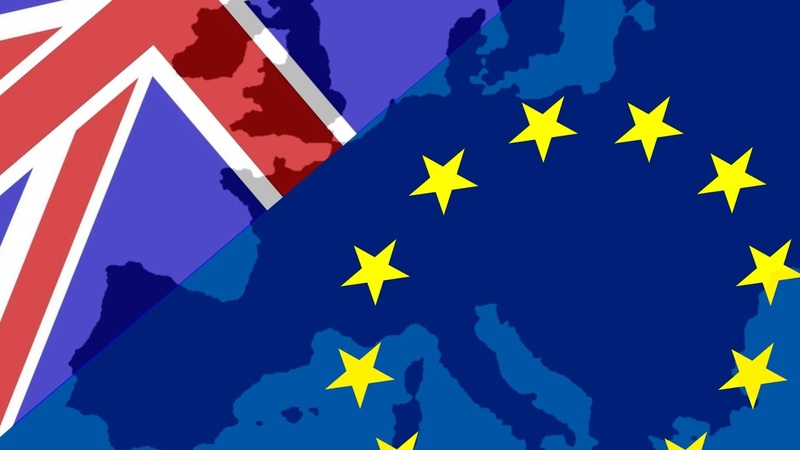 The future will not be easy - either for the United Kingdom or for the other European states. Parliamentary democracy and responsible accountable government are not problem-free. They require commitment on the part of citizens and hard work on the part of those the citizens elect to govern in their name. The dominant dynamic of post-modernity has been citizen passivity, characterized by diminished commitment and participation and the denigration of cultural diversity and experience reflected in tradition. To reverse that course will be a challenge. There are no guarantees in political life. But perhaps this single step will be partial beginning in that multi-mile journey. Whatever one thinks of the show itself and its artful attempt to combine contemporary political commentary/satire with science fiction/horror, I think that Laurel's two sentences speak volumes - not only about the on-screen interaction between Laurel and Gareth (and most of the other characters) but also (as presumably it is meant to do) says something about our contemporary national political culture. And, of course, the tragedy is that we do not have alien ants from outer space to blame for this sad state of affairs. Rather we have ourselves - and mainly ourselves, as citizens and voters - to blame. And nothing has highlighted this state of human - not just congressional - dysfunction more than the current presidential election campaign (which is also actually the ostensible background in Brain Dead). What commonly passes for "populism" in modern American politics - whether on the right (Trump) or on the left (Sanders) - is often a sudden awakening of a passive population that has largely justified its passivity by promoting a cynical view of politics that blames politicians for society's problems but never blames the voters who put them in power. (Voters here also includes the non-voters, whose cynical passivity must in the end be counted as a de facto vote for the establishment they purport to abhor.) This is an important undercurrent in American politics that inevitably has exaggerated the power of intensely motivated ideologues within the established political parties. There are, of course, also institutional factors, proper to the peculiar constitutional construction and institutional dynamics of the American political system that sometimes - often, in fact - set it up for failure. These familiar factors are real enough and should not be underrated. On the other hand, history shows how it has been possible - a challenge at times, but not impossible - to overcome our peculiar constitutional construction and institutional dynamics to get things done when sufficient social consensus existed. It has been the complete collapse of the post-war social consensus, starting already in the 1960s and rapidly escalating in more recent decades, that has made it virtually impossible to practice any semblance of normal politics anymore. Inherent in the collapse of the post-war social consensus has been the capture of both political parties (but one much more than the other) by extremist ideologies. Both parties have purged themselves of their centrist, more moderate wings and increasingly moved to their respective ideological corners. As a result, both parties are simply less well equipped to - and less inclined to try to - talk rather than just contradict each other. That said, one party remains bigger and more diverse and more focused on practical policy outcomes. The other keeps shrinking (and aging) and has become increasingly more focused on opposition almost for the sake of opposition. 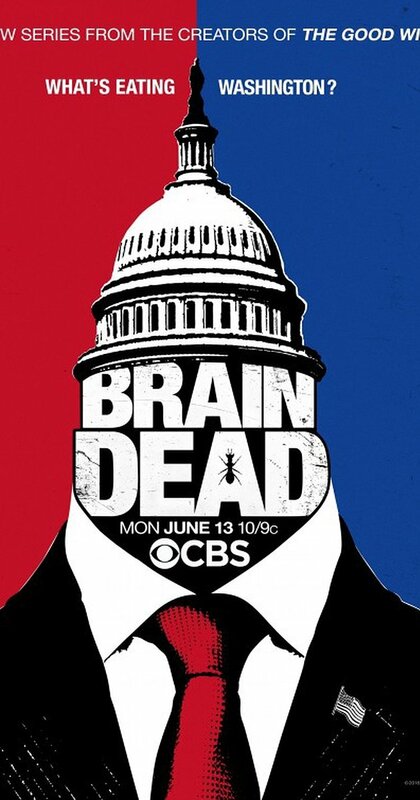 Whatever the show's artistic and dramatic merits, Brain Dead does at least portray the cynical opportunism and ideological extremism that has captured both parties, while highlighting how much worse it is on one side of the aisle. To the extent that that illustrates - in the form of entertainment (the preferred post-modern medium for experience) - what we should all already know from honest observation, the show is performing a service of sorts against the dispiriting background of our dysfunctional politics and our discouraging election campaigns..
One does not live by bread alone (Matthew 4:4).Much of modern politics is premised on the rejection of that famous sentence of Jesus. It is the economy and economic issues - the famous Reagan question, "Are you better off now than you were four years ago?" - that typically tend to dominate modern democratic politics. That is certainly the premise of the "Remain" campaign in the United Kingdom, which seeks to scare voters into choosing to stay in the EU for fear of the the possibly negative economic consequences of leaving. And they may be right. On the other hand, of course, no one really knows what would happen to Britain's and Europe's economies if the UK exited the EU, because it hasn't happened before. And anyway predicting the future is always notoriously dubious. Of course, there are parts of the world where national states are more notional than real. In the Middle East (and much of Africa) many state borders are artificial at best and do not correspond significantly to any truly shared history or communal experience. It is no accident that those are places where religion plays a greater role in defining people's identities. In the West, on the contrary, national states have been long established, while religion as a significant source of group identity has been in decline. One can debate the economic merits of the EU. but as a symbol-creating community, capable of uniting people with common experience, common memories, common aspirations, and common loyalties, it has been a notorious failure. Even if the "Remain" campaign wins in the UK, the foundational failures of the EU remain exposed for increasingly disgruntled Europeans to recognize. Economic issues naturally tend to dominate political decision-making when the foundations are secure. Within a community of shared history and shared aspirations, when there is a consensus on the foundations of society, then economic questions will naturally dominate political discourse. But when the very foundations of society are shaken, when they have been thrown into doubt, when consensus about who we are as a people and what we ultimately care about has been destroyed or severely diminished, then those concerns inevitably dominate. The mere fact that a referendum on the UK's continued EU membership was needed is ample testimony to the reality that people care about who they are as a community at least as much as they care about the economy. If the "Leave" side wins, that will just be further confirmation that such things really are more important and that really one does not live by bread alone. Like most things in politics, the U.S. Constitution was a product of compromise. There are, of course, good compromises and bad ones. And there are bad compromises which are nonetheless necessary. Such were the two principal compromises required to create our constitution - slavery and federalism. Slavery, America's "original sin" was finally eradicated 76 years after the constitution came into effect, but its malevolent consequences are still with us and still permeate our politics today. However necessary it may have been to compromise with slavery for the Union to be created at all, it remains the greatest moral stain on our constitution and on the legacy of the founders. The second necessary compromise was federalism. For the founders, creating a unitary nation-state was simply an impossibility. Except for truly forward-looking thinkers like Alexander Hamilton, most Americans at that time (and for quite some time thereafter) thought in parochially local terms and owed their primary allegiance to their State, not to the United States. Moreover, the founders simply could not conceive of a republic on as large a scale as the United States. History and political theory offered examples of republican government but only on a small scale - e.g., the city states of antiquity, Renaissance Italy, and Calvinist Geneva. A country the size of the original 13 states corresponded in their categories to an "empire." The only way they could even theoretically conceive of republican government on such a scale was as a federation of republican states. So the U.S. was saddled with federalism - both for the better and for the worse. Hence the second amendment, which was intended to protect the rights of the individual states to maintain their own militias. More recently, however, the significance of the second amendment has been distorted (with the connivance of the Supreme Court) into an individual right to own a gun - and not just a gun suitable for legitimate activities like target shooting or hunting but weapons of war meant for murder on a massive scale, such as we have once again seen last week in Orlando. Invariably after such tragedies, sensible people clamor for reforms to restrict access to such weapons. And invariably the Republicans in Congress prevent any real reform - as happened again this week, just four days after the massacre in Orlando. So here we are, almost 225 years since the second amendment became part of the constitution (December 15, 1791), unable to extricate ourselves from the harmful consequences another one of oour original constitutional compromises. In the wake of the latest mass murder, this time in Orlando, Florida, a predictable war of words has exploded as various factions go to their separate corners with their competing interpretations. For some, the attack was all about homophobia. For others it was all about Islamic terrorism. And then there are those who just prefer to blame it all on "hate." Of course, in the real world - rather than the world of ideologically preset certitudes - one factor doesn't necessarily exclude any of the others. Homophobia, Islamic terrorism, and generic "hate" can all coexist quite conveniently in an individual, in a group, in a society. They could all easily have coexisted as components of this particular criminal's mindset and contributed to his crime. A complete investigation may in time sort out which, if any, were the more dominant influences in his thinking. But the inconvenient truth is that human beings are incredibly complex creatures, capable of holding multiple (and even contradictory) ideas at the same time, and may be motivated by multiple (and even contradictory) hostilities and allegiances. Sometimes those allegiances inspire us in positive ways. But sometimes they inspire the sort of hostility and hatred we have witnessed so much of in our lifetimes. And sometimes it is our own anxieties that inspire hostilities and hatreds that then go in search of suitable allegiances to offer them some meaning and purpose. Our particularly poisonous politics may make all that even worse, as certainly our unprecedented contemporary interconnectedness through our toxic modern media make it worse; but hostilities and hatreds are not new, any more than the competing allegiances our anxieties seek refuge in. Hence the uniquely liberating character – in a world of social stratification, economic inequality, and political polarization - of Saint Paul’s message that he proclaimed to the Galatians: you are all children of God in Christ Jesus. … there is neither Jew nor Greek, there is neither slave nor free, there is not male and female; for you are all one in Christ Jesus. But what makes Saint Paul’s claim any different, what makes his message any more powerful, than any other competing set of slogans? A good question – one that comes naturally to us living as we do in a world of slogans! The answer, for Paul, is clear. All our competing allegiances – and the hostilities and hatreds they inspire and that in turn make us try to double-down on those same allegiances – all are subsumed in a new belonging, not to words nor even to an idea, but to a person, the person Paul calls Christ Jesus, the same Jesus whom Peter called the Christ of God, whose identity with all of us is so central that he calls himself simply the Son of Man. What Paul calls clothing oneself in Christ and belonging to Christ involves more than Peter’s partial perception and understanding of Jesus’ identity and mission. Rather it requires a full and complete identification with and embrace of Jesus, who undermines everything else in his chosen mission as Son of Man. Peter and his colleagues didn’t understand at first. Why would they? Nothing in their experience of how the world works – of how we function (or sometimes don’t function) in our world - had really prepared them for Jesus’ challenge, for Jesus’ insistence that only his passion, death, and resurrection really reveal who he is – and in the process undermine every alternative outlook on life, every alternative allegiance, every alternative answer to our insecurity and frustration. Jesus defines his followers in terms of how fully we identify our experience with his and in the process allow ourselves to be remade by his example and according to his direction. Homily for the 12th Sunday in Ordinary Time, Immaculate Conception Church, Knoxville, TN, June 19, 2016. In the wake of the latest mass murder perpetrated in our gun-crazy country, a predictable word of words has exploded as various factions go to their separate corners with their exclusivist interpretations. For some, the attack was all about homophobia. For others it was all about "radical Islam." For some of that latter faction, it just won't do to blame homophobia at all. For some of the others, it is similarly unacceptable to ascribe any blame at all to Islam. (Thus one Planned Parent group inanely tweeted: “#Islam doesn’t foment the violence alleged gunman Omar Mateen enacted, toxic masculinity & a global culture of imperialist homophobia does.") And then there are those who, for whatever reason, just blame it all on "hate." Of course, in the real world - rather than the world of such ideologically preset certitudes - one factor doesn't necessarily exclude any of the others. Homophobia, "radical islam", and generic "hate" could all easily have been components of this criminal's mindset and contributors to his crime. A complete investigation may in time sort out which, if any ,was the dominant influence in his thinking. but the inconvenient fact is that human beings are incredibly complex creatures, capable of having multiple (and even contradictory) ideas at the same time and being motivated by multiple (and even contradictory) hostilities and allegiances. Meanwhile, people go to their separate corners and shout slogans. The most bizarre is the assertion by Donald Trump (but not just by him) that what this country needs is to keep shouting the slogan "radical Islamic terrorism." But no war has ever been won by sloganeering. It is unlikely that any terrorist will lay down his arms, or any criminal terrorist act will be more easily prevented by our shouting slogans into the air. But we do at least know who the victims were. Even if the fact that they were gay turned out to be only a partial explanation of their murderer's motives, it doesn't change who the victims were and that they were specifically targeted. Expressing sorrow or anger at the event without at least acknowledging that the victims were all gay people is hardly helpful. In that regard, Donald Trump did at least do that much, even if in service of his apparent emphasis on religion as the final cause of this killer's homophobia. The way we use (or don't use) words matters. Acknowledging the identity of those murdered matters. Acknowledging all the factors that may have played a part in the killer's motivations matters also. As does admitting that, however hate-filled he may have been, without being able to get a gun, he could not have so easily perpetrated his crime. As Senator Warren said this afternoon on the Senate floor, the murders were committed by "a terrorist with hate in his heart and a gun in his hand." Before introducing the series' central character - Laurel Healy, a documentary filmmaker who takes a job in her brother's Senate office, in a deal to get her father to pay off her student loans and fund her work) - the show sets the scene with TV images of our real-world contemporary candidates speaking and an opening observation that in 2016 it began to be noticed that people were losing their minds. Why? Well, we also see some familiar footage of a meteor landing in Russia. As we soon learn, this meteor, which gets shipped to the United States to be studied at the Smithsonian, happens to contain dangerous alien insects that will eventually crawl into people's ears and destroy much of their brains. Meanwhile, Laurel, who genuinely hates the family business - politics - but seems to have inherited some talent for it, starts work on the day of a government shutdown, caused presumably by Republican intransigence. Laurel divides her time between, on the one hand, mediating a deal between her brother and a Republican Senator, whose principal staff member is obviously Laurel's opposite number (and, this being TV, one suspects possibly an eventual love interest), and, on the other hand, trying to find out what is causing some strange behavior (which we, the audience, already know the alien source of). The image of alien insects destroying the brains of American politicians - and thus making our dysfunctional politics even worse - is intended to offer a comic knock at our poltiica system at the very time that it has such to the lowest it presumably can without the intervention of alien insects! Whether that is enough to sustain 13 episodes remains yet to be seen. But it is a good beginning so far! It is, of course, right and just to mourn those murdered Sunday morning in Orlando, to console the survivors, to condemn the homophobic hatred that seems to have triggered this tragedy, and generally to lament the regular recurrence of such crimes in our national life. Such responses we have heard and will continue to hear in abundance. In the end, however, all such concerns will lead to little or nothing until we as a society address the last of those points - the "easy access to deadly weapons." It is a fundamental responsibility of a civilized society to protect its citizens and their ability to go about their lives in relative peace by monopolizing the use of force. One of our society's highest priorities ought to be getting guns out of the hands of civilians, who in a modern civilized society have no business having them. Unfortunately, making things even worse than they already were, our notorious Supreme Court has recently rejected a long tradition of constitutional interpretation, that took the Second Amendment as meaning what it literally says regarding state militias, to misconstrue the Second Amendment as creating an individual right to have a gun. (In 2008, District of Columbia v. Heller, the Supreme Court held 5-4 that the Second Amendment protects an individual's right to possess a gun.) Until and unless that destructive mentality changes, what hope have we as a nation? Can we not say that the virtuous lives of the saints are like measuring lines stretched over souls to make sure our lives take the proper shape and measure up to their good example? Whenever, then, we celebrate the feast of a saint, let us look to them as giving us the pattern our lives should take. In speaking thus of the saints in one of his sermons, Saint Anthony of Padua (1195-1231) was obviously not speaking in that immediate context of devotion to himself. 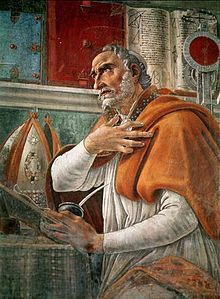 But, within just one year after his death, Anthony was himself canonized by Pope Gregory IX, and he remains to our own day one of the Catholic world's most recognized and popular saints. During the last Jubilee year (2000), I had the privilege of visiting Padua and venerating the famous saint's relics. 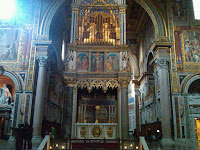 The story is told that, some 30 or so years after his death, when the saint's tomb was opened, Saint Bonaventure (then Minister General of the Franciscans) held in his hand Anthony's still incorrupt tongue and composed the antiphon: O blessed tongue, that always blessed the Lord, and made others bless and praise him; it is now manifest what great merits you possess in the sight of God. Anthony's saintly popularity is based in large measure on his reputation as a miracle-worker. As everyone knows, he is widely invoked by those seeking lost objects! But Bonaventure's praise of Anthony's tongue highlights the center of Anthony's sanctity - his evangelical zeal. Belatedly proclaimed a Doctor of the Church in 1946, Saint Anthony is known among the Doctors as Doctor Evangelicus ("Evangelical Doctor"). In this sad era that so glorifies wealth and demeans (and even criminalizes) the poor, the distribution of Saint Anthony's Bread expresses a symbolic connection between devotion to Saint Anthony and identification with the poor. As Saint Anthony reminds us in one of his sermons: Today Christ stands at our door and knocks in the person of the poor. The Congregation for Divine Worship has raised the memorial of Saint Mary Magdalene to the rank of a feast, which presumably means it will now be celebrated with proper psalms and readings in the Office and the Gloria at Mass. Apparently, she will also have her own proper Preface, which in the Roman tradition is no small thing. The text of the new preface is for now available only in Latin. I will not attempt a translation here. But, as best I can make out, the Latin text highlights the Risen Lord's appearance to Mary in the garden, in view of the fact that she had loved him while he lived, saw him die on the cross, mourned him at the tomb, and was the first to see him risen, and so was honored with a ministry along with the apostles in order that the good news of new life might come to the whole world. Mary Magdalene's obvious importance in the Gospel story and the role she played on Easter have appropriately sometimes caused her to be called apostola apostolorum ("apostle of the apostles"). So it seems altogether fitting that her feast be raised in the calendar to a rank equivalent to that of the actual apostles. On her feast last year, I posted about Mary Magdalene and the process of freeing her from her historical misidentification in the West with the sinful woman in Luke's gospel. It is one of the many unfortunate oddities of the way our presidential election process has been "reformed"over the past 40 years that it now consists of two (lengthy) phases - the primary/caucus phase and the general election phase - with the traditional party conventions largely vestigial relics of their formerly significant selves. Be that as it may, with yesterday's big primaries - particularly in New Jersey and California - the first phase has finally (mercifully) ended. Now the two real candidates are off and running. To no one's surprise - except, I suppose, to those millennials (and others who should know better) who live in Sanders' fantasyland, Hillary Clinton has won the Democratic party's nomination, awaiting only the formal ratification of the primary process by the party's convention in Philadelphia. In her victory speech last night, she set the stage for the stark choice facing the country this year. Speaking of America as "a big-hearted, fair-minded country," she effectively expressed the fundamental and long-term difference between the two political parties, what they value, and whose interests they seek to serve. And so defined the coming campaign. Remembering that today is the 39th anniversary of my graduate school graduation, I began the day by re-reading the famous letter which Petrach (1304-1374) wrote to his spiritual director, the Augustinian friar Dionigi da Borgo San Sepolcro, recounting his ascent of Mount Ventoux on April 26, 1336. Its appeal (and the reason I have long linked it with my graduate academic career) was that the climb, undertaken to fulfill Petrarch's own desire for its own sake - "the impulse to accomplish what I had always wanted to do" - culminated in a meditation on the direction of his life, a meditation guided by words of Saint Augustine, from a copy of Augustine's Confessions which Petrarch claimed always to keep with him on his person. I don't climb mountains, and i don't literally carry Augustine's Confessions with me wherever I go. But my studies were for me like Petrarch's long-desired climb, and they did lead me to a special friendship with Saint Augustine, which continues in ever enriching ways. Like Petrarch, I too have experienced the Saint's ever so powerful words almost as if they were addressed directly to me. And so it is always when we learn from experience anything important about God or the world, we learn something important about ourselves in the process. So annually on this anniversary, with the increased benefit of manifold experience and lots of hindsight, I make my own Petrarch's prayer that my thoughts may "now turn at last to the One, the Good, the True, the stably Abiding." Notwithstanding the challenging economic transformations of what Yuval Levin (The Fractured Republic: Renewing America's Social Contract in the Age of Liberalism) calls "our age of fracture," he considers the cultural transformations to have been even more so. "The postwar diffusion of American life began in the culture and has proceeded furthest there, and the accompanying economic and political changes have in many cases been responses to vast changes in mores, norms, beliefs, social expectations, and mental habits." Levin covers familiar ground, e.g., the loss of common television programs once watched by 2/3 of the nation now leaving us "with less in common at every level of our culture." He notes how even the few "still relevant elite institutions" promote cultural and moral individualism. The challenge is especially serious for what he calls "institutions of moral formation," whose proper (and increasingly counter-cultural) task is "to shape and structure our desires rather than to serve them." Examining religion, Levin notes something the implications of which have only recently been widely recognized. That is the changing attitudes not of the highly committed but of those of more nominal religious affiliation, those who in the past would have identified at least formally with traditional religious values, but who now feel freer to reject them. Because in the past social conservatives could presume more commonly shared values in society, they tend today to come across as trying to enforce a once widely shared consensus that no longer exists. They do this instead of highlighting a desirable moral ideal and trying to convert people to it. In my experience, this has long been a criticism of how some Christians, for example, have conducted themselves over several decades of cultural warfare - which they have now largely lost, without apparently learning any lessons from the experience. It could be argued that Pope Francis' apparent attempt to reset the style of Roman Catholic participation in these debates reflects a similar insight to Levin's. Of course, culture war over-reach characterizes both sides. Levin sees the controversy over mandatory insurance coverage for contraception as an example of such over-reach on the Left - "a culture war of choice initiated by the president." In general, he regards this as one of the disadvantages of our increasing tendency to remove such issues from the legislative arena - which requires persuasion and compromise - in favor of judicial resolutions, which cause both sides "to paint their opponents as irrational, and to deny that their concerns have merit." Levin warns both sides agains over-reach and bullying, which American history shows usually tend to alienate the public in the end . So what, positively, does he recommend as an alternative strategy for religious subcultures? Fist of all, he stresses the need for belief in "a vision of the good life and a deep conviction that it would be good for everyone." While "religious liberty" is important, he regards it as important primarily not as an inward-focused, defensive end in itself, but rather as a precondition for being able to appeal to the larger society with precisely such "a vision of the good life and a deep conviction that it would be good for everyone." In the absence of a now lost ability to dominate the culture, religious subcultures need to offer "living models of their alternative to the moral culture of our hyper-individualist age." If this sounds suspiciously like Rod Dreher's "Benedict Option," Levin considers what he is proposing to be by comparison a "more aspirational form of the quest for moral community." The model for the "Benedict Option" was, after all Saint Benedict's 6th-century response to a world order which was literally coming apart. Levin's perspective is less apocalyptic. "The center has not held in American life, so we must instead find our centers for ourselves as communities of like-minded citizens, and then build out the American ethic from there." What is key here is the idea of building out - rooted in the fact that such alternative subcultures seek "to embody ideals that their members take to be best for everyone, not just for themselves." That, of course, is the classic aspiration of a church - as opposed to a sect. Levin believes that, as an alternative to radical individualism, his vision should appeal even to those (such as myself) who are still strongly attracted to more traditional social cohesion. Levin is convinced that "in a nation as large as ours, it is not possible to live in actual community with the entire society." So "what is required to address the particular excesses and troubles of our age is a new rootedness that will be communal before it is national." Apart from his dismissal of the possibility of truly national community, I believe Levin's analysis has much to commend it. However committed one may be to recreating as much national cohesion as possible, it probably is always going to be the case that effective cohesion is more likely to be achieved within comprehensible communities. Consider, for example, the Catholic Church, which, prior to its existence in local Churches, is first and foremost a universal Church both in principle and in its aspirations. Yet it should escape no one's notice that the day-to-day life of that universal Church - and much of the vibrancy it displays - exist primarily in comprehensible communities. In the Church's case, such communities are primarily parishes (and also for their members religious institutes), which is where most of the action is, so to speak. To be authentically Catholic, parishes and religious institutes must remain connected to the universal Church and must nurture in their members a sense of wider global connectedness. Still, the day-to-day life of the members is formed and experiences primarily in those locally comprehensible communities. It will, therefore, largely depend less on political action and more on the character and quality of such communities - subcultures in terms of the larger national culture - how effectively religious witness will influence the larger society. "God has visited his people"
When St. Paul wanted to make his case to the Christian community in Galatia, he felt the need to introduce himself, to talk about his background, and to make the case for his authority in terms of how he came to be an apostle. The same was true for many of the Old Testament prophets – but not, it seems, for the prophet Elijah. One of the most famous and important prophets in all of Israel’s history, Elijah just appeared on the scene with no such introduction, to reprimand the wicked King Ahab. His arrival coincided with a severe drought, which led him to seek the hospitality of a certain poor widow. For a year Elijah’s presence had been a blessing for the widow and her only son. Then suddenly the son got sick and died. Not much repayment for her hospitality! Nowadays it is divorce, which is more often the ticket to poverty for women and children. In the ancient world, it was being left a widow without a man to provide for her that often led to poverty and destitution – as it often still did in our own society before Social Security and Medicare. So no wonder the widow was angry at Elijah and Elijah’s God! Even Elijah seemed to take her side. He called out to the Lord, “will you afflict even the widow with whom I am staying by killing her son?” But then the Lord heard his prayer, and Elijah was able to return the boy alive to his mother. Elijah is remembered for many things. One of them is this story of his compassion for this widow. 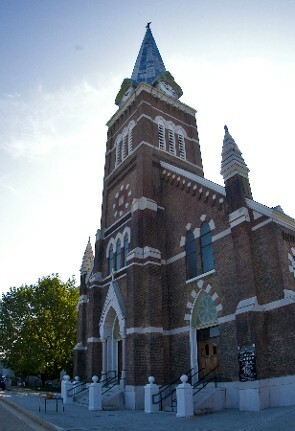 Jesus himself mentioned it in his hometown synagogue in one of the early episodes of his public life. Unlike the story of Elijah and the widow, we don’t know what in particular may have brought Jesus to a city called Nain, where he was greeted at the city gate by yet another grieving widow, mourning her only son. It was (to borrow St. Augustine’s famous phrase) a case of misery meeting up with mercy. As far as we know, Jesus had no prior connection with the widow. Unlike Elijah, had not benefited from her hospitality. In that sense, he didn’t really owe her anything. But that didn’t block his compassion. And it was that compassion, in fact, which created a connection between them. Moved with pity for her, he touched the coffin, and said, “Young man, I tell you arise!” The dead man sat up and began to speak, and Jesus gave him to his mother. In those otherwise unimportant places, God visited his people – unimportant people, poor people, widows with no source of support, sons whose lives were being cut short way ahead of time (as happens violently to so many in our own society today). God didn’t just visit. He connected with them in a personal way. Elijah and Jesus did so directly by touching the dead bodies, which, of course, risked ritual impurity from contact with a corpse. Elijah and Jesus didn’t just speak God’s word, they acted it out, by touching the dead, and thus bonding with all grieving and suffering people there and everywhere. Both Elijah (in anticipation) and Jesus (in fulfillment) were revealing the kingdom of God – not just talking about it as an abstract idea, but making it happen in people’s messed up lives by bonding with them. And, like the widow’s son, our own response to the surge of new life within us must be to get up and speak. Like the grieving widows and the people in the crowd, we too must recognize God’s word at work in our world, God visiting his people. And not just visiting, but staying with us! Our human lives are created by the power of God, but they are maintained and sustained by his incredible compassion in not just visiting but being with us in Jesus – and in his Church. As beneficiaries of Christ’s compassionate presence in our lives, we are called upon to be its witnesses - to continue to express it and share it in our ordinary (and hence not so ordinary) lives together, embodying God’s new kingdom with one another in our world.